vGPCR/LacZ+ cells accumulate over time in lesional areas. (A) iORF74 mice were generated by coinjection of a DOX-dependent activator and responder vGPCR transgene (bracket indicates transgene cointegration). iORF74 mice and TRE-LacZ mice were crossed (X) to generate iORF74/LacZ mice. hLCR, locus control region; p, CMV minimal promoter; rβglobin A, rabbit β globin polyadenylation signal. 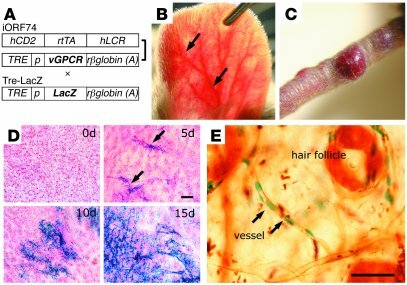 (B and C) iORF74/LacZ mice develop highly vascularized lesions in the ears (B, arrows) and tumors in the tail (C), depending on the length of DOX treatment (30 days and 100 days respectively). (D) β-gal whole-mount histochemistry of ears from iORF74/LacZ mice untreated (0 d) or treated with DOX for 5, 10, and 15 days (n = 6 ears per time point). No blue cells were found in ears of control mice (not shown) or untreated iORF74 mice. After 5 days of DOX treatment, small clusters of blue cells were detected (arrows). The number and the size of clusters increased over time. Scale bar: 100 μm. (E) Visualization of the vascular tree and vGPCR/LacZ+ cells using biotinylated L. esculentum lectin and β-gal whole-mount histochemistry. After 10 days of DOX treatment, vGPCR/LacZ+ cells were present in small capillaries or venules (arrows) and surrounding hair follicles. Scale bar: 20 μm.